Spring Door Hinges are self-closing, due to their spring-loaded design. This is a very desirable feature on exterior or garage doors, providing an added measure of security and peace of mind -- especially when dealing with small children or pets. Spring hinges are adjustable using an alan wrench on the hinge barrel. You can adjust the tension on the hinge for more or less, depending on your needs. Generally spring door hinges are used on exterior doors. These hinges are sold in pairs. Most exterior doors will use 3 hinges, and most of the time a spring hinge in the top and bottom position will provide adequate tension to close the door. Sping hinges are a less expensive and great solution to a standard commercial door closer. Keep in mind that it's always best to order hinges in the same brand as your door hardware for the best finish match between the hardware. 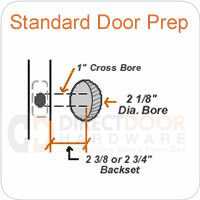 To get started, just select which size door hinge you need.